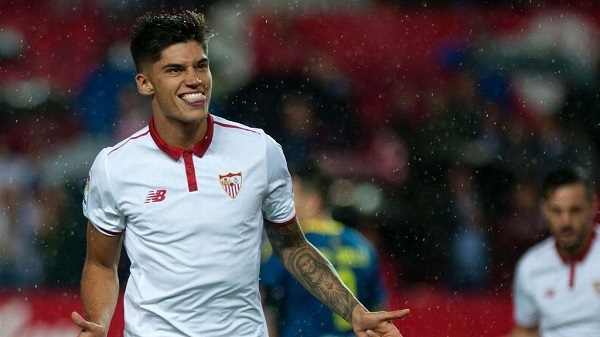 Joaquin CORREA scored for Sevilla in their 2-1 win against Celta. It was Jorge SAMPAOLI’s Sevilla against Eduardo BERIZZO’s Celta. The future Argentina National Team coach Jorge SAMPAOLI’s team won 2-1 courtesy of a superb goal by Joaquin CORREA. Not to be outdone by Javier MASCHERANO who scored his first goal for FC Barcelona, the Sevilla man picked up the ball and while channeling his inner Lionel MESSI, ran across the area dribbling around defenders before putting the ball past the goalkeeper. Our all midfield and stiker can 🥅 🥅 🥅 goal..
Gomez – very intelligent player unlike Di Maria. agreed gonzalo… intelegent plyers makes a team better… inteligent players argentina have… lanzini messi pastore papu gomez dybala banega aguero(in the box) … who is nacho fernandaz if he is good enough then any eueopean club linking with him.. who they are? Nacho Fernandez is a central midfielder of River Plate. Maybe missing link of NT. I don’t think any European club is interested at the moment. He is not of the youngests. Gomez is a monstrosity, easily one of the best players in europe right now, it’s really strange that we haven’t heard of him until this season. Along side Gomez, I think Nacho, Peruzzi, Tagliafico, Rulli, Piatti, Perotti, Lanzini, Paredes and ofcourse Icardi should all be called up ASAP by Sampaoli. On the other hand Kun, Pipita, Dimaria, Masch, Biglia, zabaleta and Banega should be thanked for their services to the NT while being shown to the door. no doubt. That’s why we should follow even players from Ukraine league while Gomez was there not long ago. Speaking of ukraine, Chucky is doing really well, he’s quite the goal predator, reminds me of Batigol and crespo alittle bit. Brazil coach Tite is not interested to play against Argentina friendly in Australia. I really hope Sampaoli considers Papu Gomez, he has been consistently good all season and warrants a chance with the NT. Other potential NT material from Primera: Bou, Centurion, Nacho Fernandez, Druissi, Pity Martinez, Quarta? Tagliafico, J.L. Gomez and Peruzzi have been mentioned many times before. Another potential right-back candidate Di Placido. Acúña and Alario have been called up before and I think they still deserve to be called. In fact our two #9s should probably be Icardi and Alario. Icardi, Papu Gomez and Nacho Fernandez are must for me. 2 days ago Nacho was once again outstanding in Copa Libertadores. Unfortunately catch injury and will not play in Superclassico. Hope Sampaoli knows who is Nacho. Yup, Di Placido is best RB of late in league and keeps the level in Copa Libertadores. Here’s what have been written about his last league game on Golazo Argentino: “There is good reason why a number of clubs are looking at Leonel Di Plácido and despite suffering defeat to Racing on Saturday, the 23-year-old was outstanding at right back. Seven tackles and four interceptions highlighted his defensive work while a game high seven successful dribbles and a pin-point cross for the third goal showed how much of a threat the former All Boys defender is going forward”. Of course assists as well – more than Peruzzi or Gomez. Surprisingly Godoy Cruz is best Argentina team in CL as far. And I must to notice about few players of this all over positions interesting team. CM Fabian Henriquez (2 assists last game). LB Fabrizio Angileri, No.10 Gaston Gimenez and Angel Gonzalez. And of course Gullermo Pol Fernandez. The players worth attention IMO. Tapia confirms that sampaoli will be the coach.